Boost school spirit with these homecoming ideas for floats. No matter how much planning and hard work it might take, the end result is sure to be a success if you choose a design that's fun to create. The most memorable homecoming floats are often the ones that incorporate unique elements and class members as part of the float. Typically, the entire school chooses one cohesive theme for the floats then each grade level picks a theme within that broader category. Homecoming is nothing without school spirit. Infuse some life into your float by using your school's colors in creative ways. Purchase festooning, or strands of tissue garland, in your school's colors and outline the entire float with its alternating colors to create a striped, rainbow effect. Build your float's design around a phrase or slogan that features the words "spirit," "pride," your school colors, or the school mascot. Use materials in school colors to write the phrase on your float. Make your float in the shape of the school mascot or its head. You can use a dome tent as the structure under colored paper or blankets to create rounded shapes like animal heads then shape cardboard into features like ears. Create an interactive float that feels more like a music festival to get the crowd dancing and having fun with you. Choose a specific music festival and copy their logo using your class name instead of the festival name or make your float look and feel like a live concert. 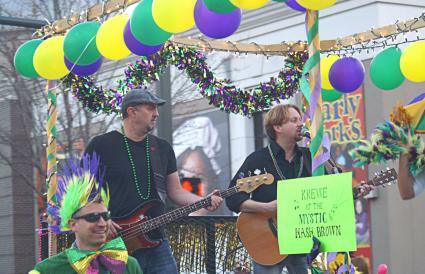 Your class rocks when you host a live band on your float and dress for their musical genre. Use tie-dye and peace signs to decorate your Woodstock float and play music from those who performed at the original festival. Choose a slogan such as "Sophomores Make Peace, Not War." Create a Coachella float that features a teepee made from wood and blankets, dream catchers, and balloons in soft colors. Play music from the festival's artists and have your whole class wear flower crowns. A patriotic float is obviously a simple one to decorate, but with a few unique touches, it can be transformed into something unexpected. You'll not only show your class pride but pride for your country too. Make a human flag on your float by having a row of students standing along each edge of the float. Bleach the bottom half of a pair of red pants for each person then die the top half of a white shirt red so each person's whole body is covered in red and white stripes. The two or three people on the left can paint their faces blue with white stars while all the others paint red and white stripes on theirs to create a human flag. Make fireworks that look realistic by hanging strands of battery powered lights over brightly colored umbrellas that match the color of the lights for teens to carry. Have a couple of your team members dress up in patriotic costumes such as Uncle Sam and Lady Liberty wearing sashes that say something like "Sophomore Pride." Host a luau on your float that features classic luau items and decor in school colors. Make a fake spit out of sticks or lumber then put a giant stuffed animal on it with the name of another class attached to it like a pig roasting at a luau. Get the crowd involved by tossing leis in your school colors. Spell out your graduation year on the float using plastic grass skirts. Use mythological creatures and legends as the theme for your epic float that gives your class legendary status. Use a slogan like "Seniors Rise Again" and have each person dress like a phoenix who squats then stands up tall all the way down the parade route. Use red, orange, and yellow paper plates to decorate your float in an ombre color design where the plates resemble feathers. Fill your float with cardboard cutouts of all kinds of mysterious creatures like Bigfoot, unicorns, and mermaids under the phrase "Junior Class - The Myth, The Legend." Decorate your float with cotton batting to look like a cloud and dress like Gods and Goddesses for a mythological theme like "The Freshman Class Has Spoken." Even if your parade is during the day, you can make an awesome glowing float like no one's ever seen before! Line your float with pop-up event canopies and cover the two ends that face the vehicle and the back of the float to create a bit of shade or darkness. Decorate black paper with neon paints to give that glowing look and string battery-powered lights inside your dark tents. Toss glow bracelets or glow sticks to the crowd to wear later at the homecoming game or dance. Creepy shows like "Stranger Things" on Netflix make great inspiration for an intimidating float. Use iconic things from the show to decorate your float. Turn your float into a giant Eggo Waffle box using wood supports and cardboard. String Christmas lights on a dark wood or cardboard wall to spell your class year or slogan. Make a giant Mindflayer hovering over your float using black balloons tied together to make its shape. Turn today's most popular YA novels into class floats by decorating your trailer to look like the book's cover. Use The Poet X as inspiration and decorate your float in shades orange and pink. Use black and white letters or paint to write poems all over the float. 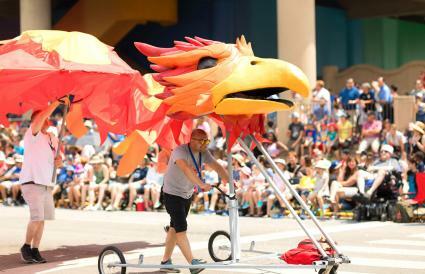 Create your own Hunger Games float using a giant Mockingjay symbol, paper flames, and having everyone dress like characters from the book/movie. With a slogan like "The Freshman Class is Magic" you can dress like witches and wizards and decorate your float to look like one of the many settings from Harry Potter such as the school itself or the train. 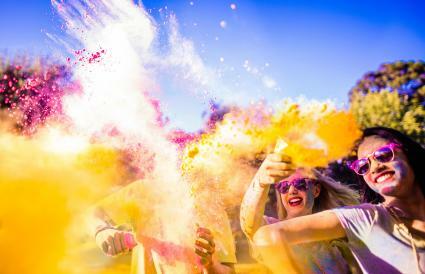 You've probably heard of a color run where people get doused in different colors while running a 5K, but have you ever seen a color bomb float? Use a slogan like "Senior Class is THE BOMB!" Make your own color powder to throw my mixing about 3/4 cup of water per 2 cups of cornstarch. Color the mixture with food-safe gel food coloring then dry naturally or in the oven. Splatter paint your float by covering it in white paper or sheets then throwing paint-filled balloons or flinging paint off paintbrushes at it. Have all float participants wear all white except for a colored bandana somewhere on their outfit. There are tons of stereotypes about teens you could use as the theme of a float. Use your slogan to make a statement about how the stereotype isn't true. With a slogan like "We're Addicted to School Spirit, Not Social Media" you can decorate with fake cell phone screens made from cardboard and paper. Use the stereotype that teens are lazy to create a float filled with places to relax like camping chairs and beanbags. Have everyone relaxing wear shirts with the other class names on them then have classmates with your graduation year walking next to the float with a phrase like "Juniors: Never Lazy, Always Living it Up!" Decorate your entire float with emojis made from paper and cardboard and wear emoji masks. Use a slogan such as "Freshman, Cool in Every Language!" Homecoming parade floats seem simple, but they require a lot of planning, hard work, and teamwork. If you want to win Best Float, follow a few tips and tricks to stand out from the crowd. Make sure your float fits in with the chosen school-wide homecoming theme. Choose a theme you're all excited about. Find out what other classes are doing to ensure yours will be wildly different. Use recycled materials in innovative ways to keep costs down. Find an enclosed space where you can always work on the float. Take the float for a test drive to make sure everything stays in place. Stay in character during the parade. Incorporate as many senses as possible by playing sounds/music and throwing goodies. The whole point of your homecoming float is to show off the creativity, personality, and work ethic of your class. Give the other grades a run for their money when you start with a winning homecoming float idea then make it a reality.